So there’s a bumper crop of courgettes in my kitchen garden right now and I gotta be honest I would take a bath in these if I could get away with it!! Following on from the very first recipe with courgette – the stuffed courgette flowers I decided to head down the simpler route and toss them in garlic and sausage…unbelievable, truly unbelievable. Courgette is probably one of the most versatile vegetables out there, stuff them, fry them, bake them – you name it these babies can take everything and give it back to you in spades!! Try this recipe with a simple Italian sausage – maybe even chorizo – it will knock your knickers off. Pretty straight forward this one…stick the pasta on, into boiling salted water (no oil in the water..that;s rubbish by the way) so you will have about 20 minutes to get the rest together. Add the oil to a wide pan, warm then in with the garlic and saute until you can smell it then straight in with the sausage and courgette. Gently fry for about 8-10 minutes until the sausage is just cooked and the courgette is just soft. 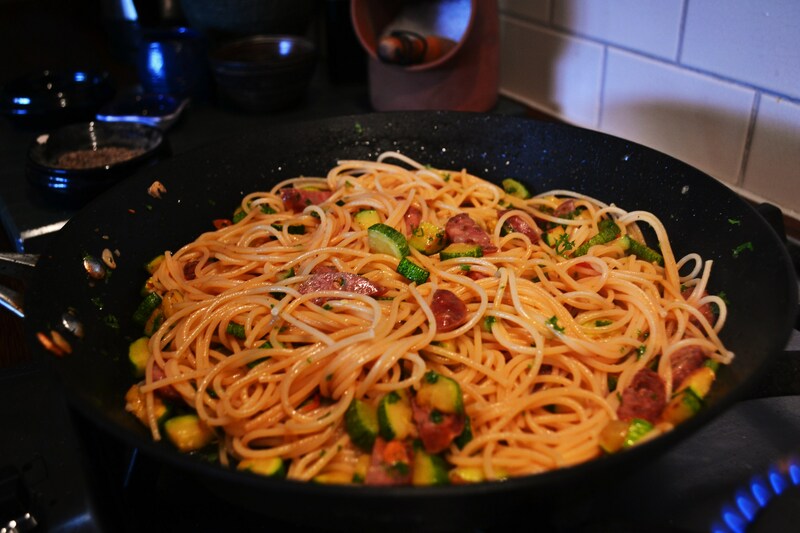 Turn off the heat and when the pasta is cooked (just at biting point) then lift it into the sausage and courgette and bring some of the salty, starchy water with you – mix well and serve. Finish the dish with a healthy scattering with Pecorino! Go on ya good thing! Lovely use of these delicious veg. I got a take away veg soba noodle for my lunch during the week. It was almost all courgette. No complaints. Michi Sushi, beside the office, inexpensive and good quality. About the only take out I do, apart from an occasional ‘one and one’. OK – I’ll buy that Conor 🙂 Whats a one and one?